"For anyone that was offended by my comments, I certainly apologize," she said. In a race that was supposed to be a Republican rout in the Deep South, GOP incumbent Cindy Hyde-Smith's campaign seems to be stumbling after a series of public statements on video and a collection of public photos from 2014 were released, calling into question her views on race and voting rights. In the first and only debate in the race, Hyde-Smith sought to address those concerns — reading an apology from her notes to "anyone offended by my comments" — a vague reference to the uproar over a racially tinged joke about "public hangings" that pushed the race into the national spotlight and unexpectedly shifted the tenor of the race in favor of Democratic candidate Mike Espy, with national party leaders, including 2020 potential contenders flocking to Mississippi to campaign for him. But then she called out Espy for using her comments as a "a political weapon." "I also recognize that this comment was twisted, and it was turned into a weapon to be used against me," she said. "A political weapon used for nothing but personal and political gain by my opponent. That is the type of politics Mississippians are sick and tired of." Espy stood only a few feet from her as he responded, "Well, no one twisted your comments because your comments were live. You know, it came out of your mouth. I don’t know what’s in your heart, but we all know what came out of your mouth." "It’s caused our state harm," he continued. "It’s given our state another black eye that we don’t need. It’s just rejuvenating those stereotypes that we don’t need anymore." (Rogelio V. Solis/AP, FILE) Sen. Cindy Hyde-Smith speaks at the Neshoba County Fair, Aug. 2, 2018, in Philadelphia, Miss. Espy again admonished her comments in his closing statement, asserting, "We got a senator here talking about public hangings and talking about voter suppression, ladies and gentleman, I am not going back to yesteryear. We are going to move forward." Hours before the debate on Tuesday, photos surfaced on Facebook showing Hyde-Smith donning a Confederate soldier hat, with the caption "Mississippi history at its best." The existence of the photos was first reported by Politico. Hyde-Smith's campaign declined to comment to ABC News on the photos. This new controversy comes amid numerous missteps by Hyde-Smith ahead of the special election — the last open Senate seat of the 2018 midterm elections. Although she failed to clinch 50 percent of the vote on Nov. 6 to win outright, Hyde-Smith was on a winning trajectory in the upcoming runoff on Nov. 27 against Espy, a former Clinton Cabinet secretary. The Republican senator embraced a supporter at a Nov. 2 campaign stop in Tupelo after he praised her and said before a cheering crowd, "If he invited me to a public hanging, I'd be on the front row." Only four days later, another video surfaced showing Hyde-Smith seeming to support voter suppression. "Then they remind me, that there's a lot of liberal folks in those other schools who that maybe we don't want to vote. Maybe we want to make it just a little more difficult. And I think that's a great idea," she said to a group of supporters in Starkville on Nov. 3. Despite evoking language reminiscent of lynchings that scar Mississippi's history and also appearing to support voter disenfranchisement — another battle wound for African-Americans in the south — Hyde-Smith did not apologize for either comment before Tuesday's debate. Instead, she called the first "an exaggerated expression of regard" and the latter "a joke." Her African-American challenger’s long-shot bid has now edged closer into competitive territory and the national Democratic network mobilized in the hopes of delivering a potential upset. Pouring in resources to bolster support from the state’s Democratic base and sending in Sen. Kamala Harris of California, Sen. Cory Booker of New Jersey and former New Orleans Mayor Mitch Landrieu to campaign alongside the former congressman, Democrats are staking their hopes on Espy to continue their momentum in the midterms. On Monday, Former Vice President Joe Biden, another potential 2020 contender, endorsed the former agriculture secretary in a video. The top Democratic super PAC for Senate Democrats, the Senate Majority PAC, invested $500,000 to flood the states' airwaves. The ad buy began on Nov. 16. A first ad targeted Hyde-Smith on health care, suggesting she is in the pocket of health insurance companies and will increase health care premiums — without mentioning the Affordable Care Act. As a red state Democrat in the south, Espy’s task is a balancing act: embracing the core of his voters who he can help propel him back into national politics, while also convincing more moderate voters of his political independence. Using his moderate appeal to attract white voters, Espy is running as an "independent" Democrat. "Even though I'm a Democrat, I'm an independent — a small 'I' — Democrat, meaning that I'm a Mississippian first," Espy told ABC News in an interview last month. During the campaign, Espy showed rising momentum as he outpaced both Republicans by raising $1.17 million in the third quarter. He has raised over $163,000 in new contributions as of Nov. 13, according to his latest FEC filing. Voters in Mississippi are expected to return to the polls next week, among them will be the state’s African-American population, which stands at 38 percent, the largest of any state in the country, according to the U.S. Census Bureau. In the Nov. 6 election, black voters made up 33 percent of the electorate, and Espy captured a staggering 91 percent of that demographic, according to exit polls. The challenge for Democrats as they compete in uncharted regions of the country, however, is Mississippi’s long history as a ruby red bastion for Republicans. The last time the state elected a Democrat to Congress was 1982 when former Sen. John Stennis secured a final seventh term. The last time the state sent an African-American to the Senate was during the Reconstruction Era when the state voted in former Sens. Hiram Revels and Blanche K. Bruce in the late 1800s. In the 2016 presidential election, President Donald Trump carried the state by nearly 20 percentage points over Hillary Clinton. And although he advanced to the runoff after defeating another Republican in the race, state Sen. Chris McDaniel, Espy only benefited from the special election’s non-partisan jungle primary format that requires a candidate to net a majority of the vote to win outright. 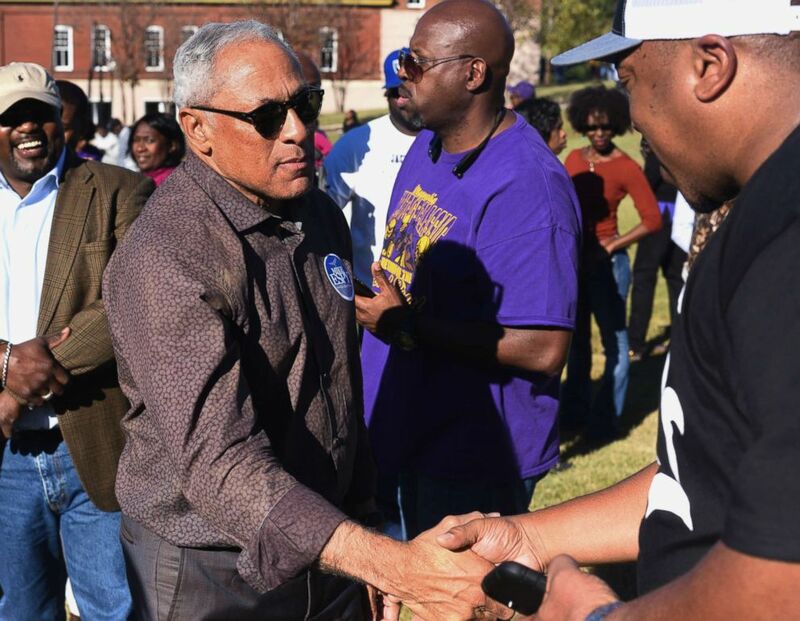 (Courtland Wells/The Vicksburg Post via AP) Mike Espy, who is seeking to unseat appointed Sen. Cindy Hyde-Smith, R-Miss., shakes hands with a supporter during a rally in Vicksburg, Miss., Nov. 16, 2018. Espy advanced to the runoff after the two Republican contenders split the GOP vote, garnering 40.6 percent of the vote on Nov. 6, only 0.8 percent behind Hyde-Smith. McDaniel netted about 16 percent of the vote. Now, the Magnolia state is finding itself in the same breath as neighboring Alabama — a state that sent Democrat Doug Jones to the U.S. Senate last year, after a sexual misconduct scandal crippled Trump-backed Republican Roy Moore’s bid. Jones, a civil rights attorney, became the first Alabama Democrat elected to the Senate in 25 years. Espy hopes that he can replicate Jones’ stunning victory and shrink the GOP’s advantage in the incoming Senate. Similar to the coalition that successfully sent Jones to the Senate in 2017, Espy will have to turn out African-American voters and appeal to moderate white voters to win. "We have to get the African-American vote out in higher numbers than it's ever come out before," he told ABC News. "We have to make sure everyone regardless of race comes out. Get the African-American vote out. Get enough of what I call 'purple people.' They may be Republicans, they may be Independents, I don't care." But some Republicans are intensifying their efforts to secure Hyde-Smith's hold on her seat amid growing concerns over her candidacy. On the eve of the special election, Trump is heading back to the state for two rallies to salvage her presumptive lead. His visit to Tupelo and Biloxi, two GOP strongholds in the state, is being buttressed by support from national Republicans, who are spending more than $1 million on ads across the state. 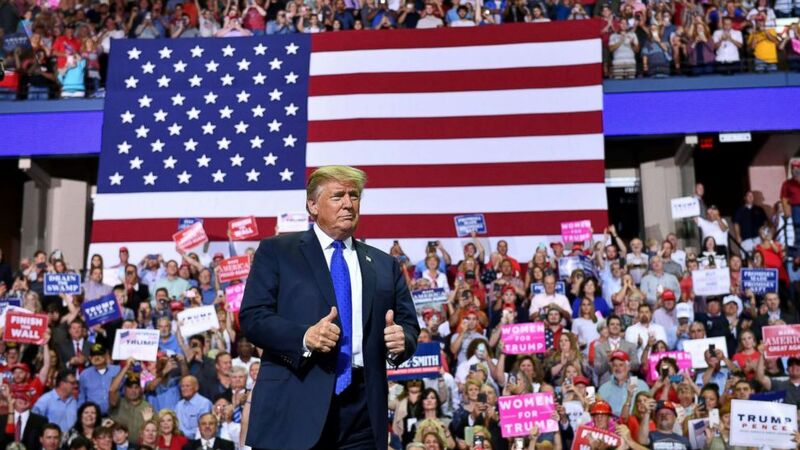 On Tuesday, Trump defended Hyde-Smith and said it was a "shame" that she is facing criticism over a comment "said in jest" when asked about her candidacy on the White House North Lawn Tuesday. "She is a spectacular senator. She came in, did a fantastic job in a short period of time," the president told reporters. "She made a statement which I know that she feels very badly about it, and it was just sort of said in jest. She's a tremendous woman, and and it's a shame that she has to go through this." The National Republican Senatorial Committee independent expenditure is contributing over $700,000 in ads and might boost their spending, according to a Republican source with knowledge of the ad buy. A first ad began airing on Nov. 15, focusing on Trump's "drain the swamp" rallying cry and attacking Espy as a "high paid lobbyist." A top Republican super PAC, the Senate Leadership Fund, also began running ads statewide on Nov. 16, with an ad buy reaching just over $1 million for TV and radio through the runoff. There’s also a $130,000 digital component, according to spokesperson Chris Pack. A new digital ad from Hyde-Smith's campaign, released Friday, touts an alleged connection between Espy and the African despot who refused to give up power in the Ivory Coast and is now on trial for crimes against humanity in International Criminal Court. The statement and the ad are based on a Fox News report, released Thursday, that published a U.S. Department of Justice Foreign Agents Registration Act document that questions if Espy lied about receiving payments as part of a lobbying contract with the Ivory Coast's former president. Hyde-Smith reported 17 new contributions totaling $65,700, including $5,000 from Google's PAC, on Tuesday, shortly after the controversy erupted, according to Open Secrets. Google's contribution is the PAC's first to Hyde-Smith’s campaign, but the company told Open Secrets it was made far before her controversial remark. "This contribution was made on November 2nd before Senator Hyde-Smith’s remarks became public on November 11th," a Google spokesperson told Open Secrets. "We do not condone these remarks and would not have made such a contribution had we known about them." 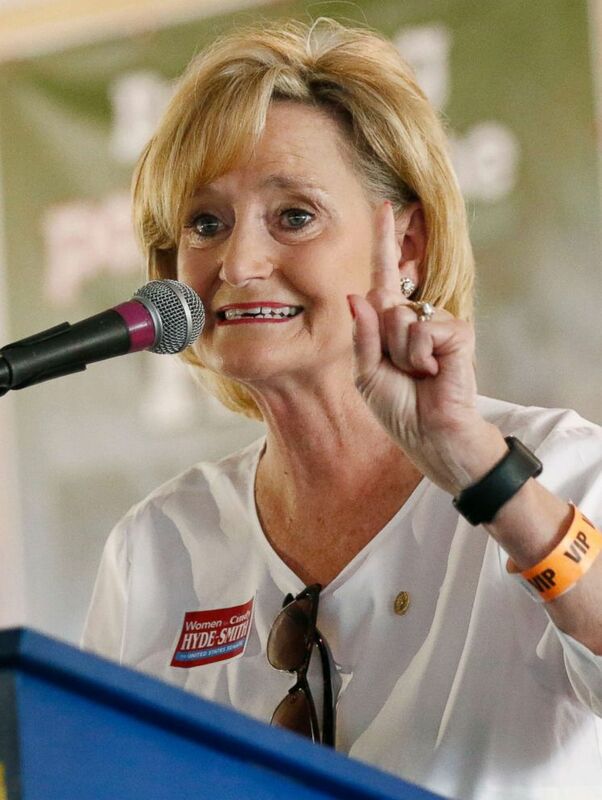 But some top Republicans distanced themselves from Hyde-Smith in the wake of her controversial comments and even conceded that the outcome of this race is no longer assuredly in the hands of the GOP. "I think we have to be concerned when candidates say stupid things," ABC News contributor and former New Jersey Gov. Chris Christie said on ABC News’s This Week. "Candidates matter. And so now this race will be much more watched. I think the Republican will still win but I think they’ll be much more watched because when candidates say things that, you know, aren’t — aren’t right, aren’t smart, they get more attention." When asked if he thought the seat was legitimately in play, Michael Caputo, a former senior advisor to the Trump campaign, said on CNN, "I think so. Mike Espy, by the way, appeals very much to white voters. He is a very bright man with a lot of history of strong contributions in Washington."